Video has evolved to become one of the most effective tools for marketers in all stages of the customer journey. 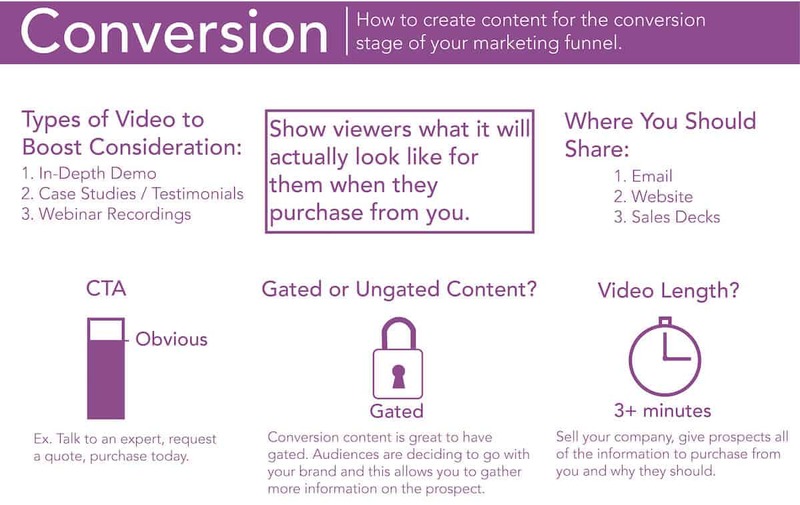 Where it once was only valuable at the awareness stage, video is now essential for consideration and conversion as well. We’ve broken down each stage of the funnel and given you the necessities for creating video content at each stage. 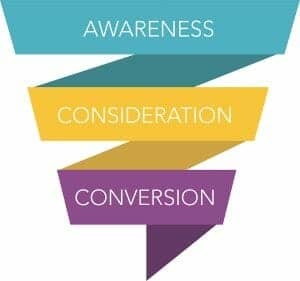 In the awareness stage of your marketing funnel, you want to focus on creating videos such as brand spots, social content, and how-to videos. 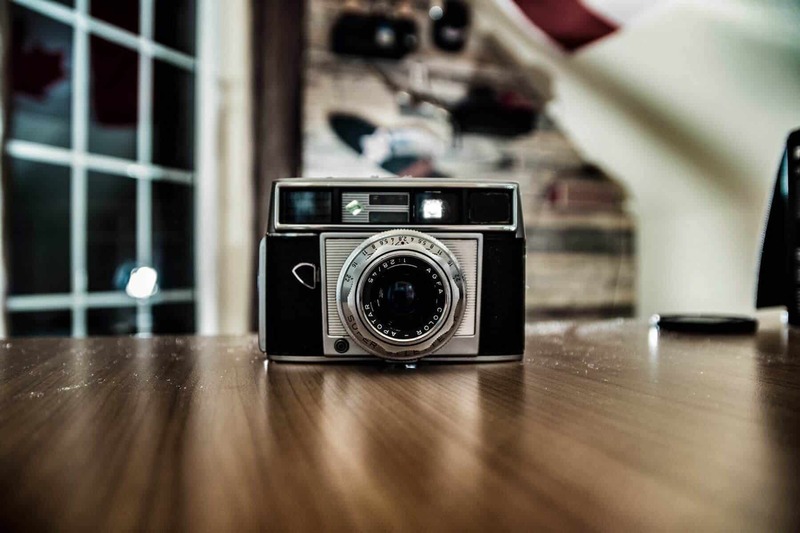 Share your video content on your website (specifically your homepage), social media (Facebook, Twitter, LinkedIn, Instagram, etc. ), and finally link to them in your blogs and other content you are putting out. Keep your video under one minute in this stage since at this point you are just introducing yourself to your audience – letting them know who you are and what you do but make sure you don’t overwhelm them with information. Keep your call to action subtle and your content ungated. And finally don’t forget to entertain, educate and engage your audience. Now it’s time to begin to get serious about the benefits that you offer to your customers, show your audience what they could be getting. In the consideration stage of the marketing funnel, create explainer videos, case studies, testimonials and about us/corporate videos. Share this content across your website, on social media, and through your email newsletters. 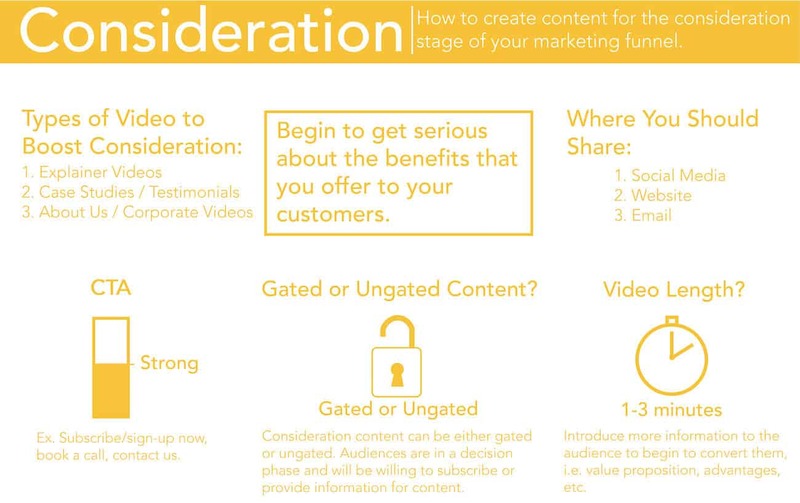 Keep your consideration video content between 1-3 minutes since you want to start introducing more information to your prospects while you’re beginning to convert them. Tell them the most relevant information, what makes you different, why clients should work with you, etc. Have a strong CTA and share either gated or ungated content. In the conversion stage, you should be showing your leads what it will actually look like for them when they purchase from you. Create in-depth demos, case studies/testimonials, and webinar recordings. Share this content across your website, in emails, and in your sales decks. 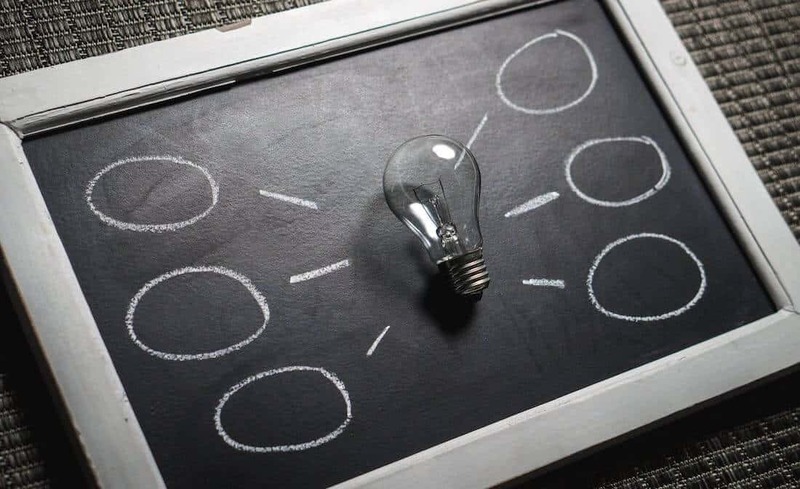 Feel free to create conversion content that is longer than 3 minutes, at this stage, you have your prospects’ attention and they just need a final push to purchase from you. This is when you sell your company, your product, and give them all of the information they need to know to buy from you. Here you should have an obvious CTA and keep this content gated. Want to learn more about video, marketing, and strategy? Check out these articles! Alison is the Jr. Sales and Marketing Coordinator at Media One Creative. With a passion for marketing, content, and creativity, Alison has been working in various startups for over 3 years.